OLATHE — Martin Talavera, Ph.D., is joining Kansas State University Olathe as an assistant professor of sensory analysis and consumer behavior. In the position, Talavera will conduct sensory analysis research in the Sensory and Consumer Research Center at K-State Olathe — part of the internationally recognized Sensory Analysis Center in the College of Human Ecology; instruct on-campus and distance classes at K-State Olathe and the Manhattan campus; and perform outreach and service to communities served by both campuses. "Returning to Kansas State University for me feels like coming back home," Talavera said. "I spent many great years as a student where, where I learned so much as a researcher and a professional. Now, in this position in Olathe, I hope to bring my industry experience back to the service of the university and the community. I also hope to develop new ties with local and international institutions, especially in Latin America, to help bring sensory science to the forefront in other parts of the world." Talavera joined K-State Olathe Aug. 15. He brings more than seven years of industry experience, having worked for Mary Kay Inc., Peryam and Kroll Research, PepsiCo Inc. and Kellogg Company. He also was a graduate research assistant at the Sensory Analysis Center and a graduate teaching assistant at the Science of Foods Labs at Kansas State University. He is a member of the Society of Sensory Professionals and the Institute of Food Technologists. Talavera has published five studies in scientific journals and has given a guest lecture. He also is fluent in Spanish. 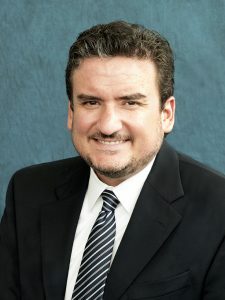 Talavera earned his doctorate and master's degree in consumer and sensory research from Kansas State University, and his bachelor's degree in agro industrial engineering from Universidad San Ignacio De Loyola University in Lima, Peru. He also holds a graduate certificate in applied statistics from Kansas State University. This article was posted on Friday, September 9, 2016, and is filed under College News, Food, Nutrition, Dietetics and Health, Sensory Analysis Center.